Beginning in 2018, security freezes are free in Wisconsin. 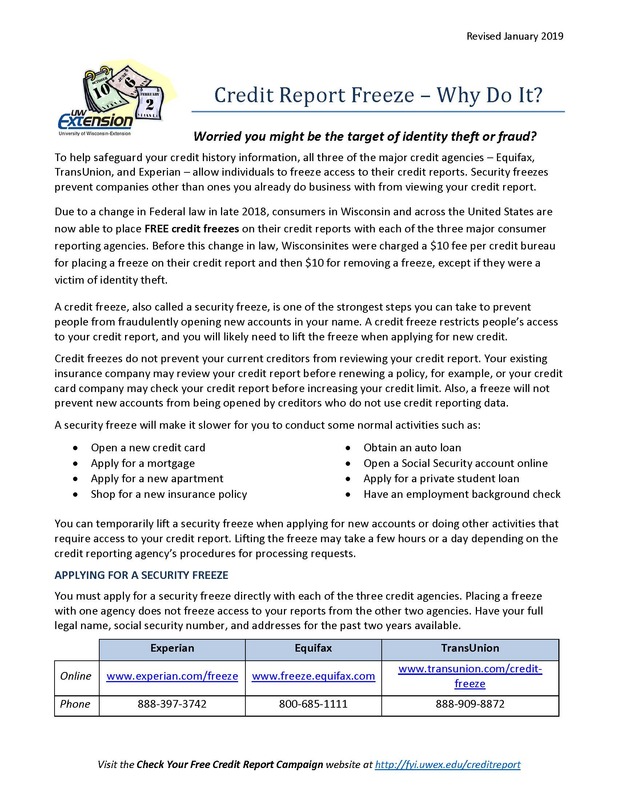 More information about security freezes is available in this UW-Extension Credit Report Freeze fact sheet. If you believe you are the victim of identity theft, visit the Federal Trade Commission’s identity theft website, which lists the steps you need to take. The FTC has a second website, “Immediate Steps to Repair Identity Theft,” with similar information. For individuals who believe they have been or will be the victims of identity theft, security freezes and fraud alerts are two ways to make your credit history more secure. 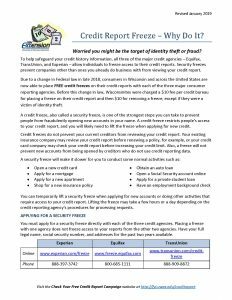 Individuals who are not the victims of identity theft may sometimes want to consider using freezes or fraud alerts to protect their credit reports. There are some potential drawbacks to using freezes and fraud alerts, and neither prevents all forms of identity theft. Therefore, it is important to make an informed decision about whether these options are appropriate for you. You must manage freezes with all three credit bureaus–Equifax, Experian, and TransUnion–separately. You must lift the security freeze each time you want to apply for new credit. This can potentially delay your ability to open new credit. Security freezes only prevent activity that requires access to your credit report. For example, somebody could still open a bank account in your name because banks typically do not check your credit report when opening new savings and checking accounts. Freezes might be especially useful for seniors because they may not need to open new credit and are increasingly targeted by ID theft scams. Children are also potential victims of ID theft, but freezing their reports can be difficult. See this New York Times blog post for more information. Initial fraud alert. Appropriate for individuals who believe they may become victims of identity theft. Lasts for one year and can be extended annually. Extended fraud victim alert. Available to individuals who prove they are victims of identity theft. Lasts 7 years and entitles the victim to a total of 6 free credit reports the first year and 3 free reports in years 2-7 (these do not count against one’s free report limit from AnnualCreditReport.com). Active duty alert. Available to members of the military. Lasts one year and can be extended each year while the service member remains on active duty.